If you’re a resident of Australia, then it’s likely that you’re a Foxtel customer. The media and internet juggernaut has been around since 1995 after it was set up via a joint venture between News Corp and Telstra. In 2011, Foxtel claimed it had gained 70 percent market share among Australian households – a figure that’s undoubtedly risen since. Foxtel customers in Australia have the option of streaming live content on their smartphone, tablet, or PC via the Foxtel Go app. There’s a plethora of sports channels as well as others sorted by entertainment, music, lifestyle, and news. Users who have subscribed to the Foxtel set-top box and broadband internet packages are given access to Foxtel Go for free. ExpressVPN Our top choice. Superfast streaming servers around the globe, including Australia. Unblocks Foxtel and most other popular streaming sites from just about anywhere. Great security features. Includes 30-day money back guarantee. NordVPN A budget provider that has a vast network of servers to choose from. Good speeds for streaming. Secure and private. Cyberghost Easy to use apps are great for beginners. Our testing revealed impressive streaming speeds. IPVanish Works great with Foxtel. Good streaming speeds but look elsewhere if you also want to unblock Netflix. VyprVPN User-friendly apps that are secure and have great privacy features. Good streaming speeds but a bit pricey. There’s also the option of accessing Foxtel Play – an internet television service that avoids all the wires and doesn’t require consumers to sign lengthy contracts. Since it’s a web-based platform, it’s possible to stream it directly from your laptop. Packages start at $25/month with a two-week free trial and the Foxtel Go app included. In this article, we’ll take you through a step-by-step process of how to access Foxtel from anywhere in the world with a VPN. It’s a great option if you’re traveling but still want to access local content like Aussie Rules Football or The Real Housewives of Melbourne. 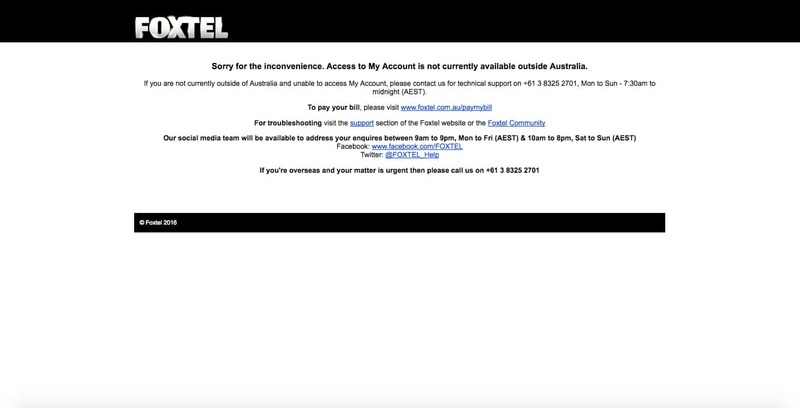 Things are fine as long as you try to log in to Foxtel via a location in Australia. But residents traveling abroad will face issues because there are protocols in place to restrict access from outside down under. The best way to solve this problem is by using a Virtual Private Network (VPN). A VPN is an excellent tool to maintain privacy and security online – it works by encrypting all the internet traffic to and from your device and tunneling it via a remote server. Users can choose from IP addresses spread across the world, thereby bypassing restrictions on content such as Netflix, Hulu, BBC iPlayer, and Foxtel. What’s the best VPN for Foxtel? ExpressVPN is a particularly robust service that boasts an impressive commitment to safeguarding user privacy and security while maintaining blazing fast speeds. It offers over a hundred servers in Australia with unlimited bandwidth. They’re part of more than 3,000 servers spread across the world offering connectivity from 94 countries. It currently operates at 6 server city locations throughout Australia. ExpressVPN doesn’t retain any user traffic logs except for metadata pertaining to the date (not time) of connection, choice of location, and total data used. All servers use the OpenVPN protocol encrypted with 256-bit AES-CBC as default. 4,096-bit DHE-RSA certificates are identified by SHA-512 hashing algorithm. HMAC authentication and perfect forward secrecy are also used – meaning unblocking geo-restricted content won’t be a problem. The VPN company has apps for both iOS and Android including desktop support for Windows, Mac OS, and Linux (command-line). It’s possible to pay via Bitcoin and torrenting is allowed on all servers. Furthermore, the company is incorporated in the British Virgin islands, which means it doesn’t fall under the purview of any mandatory data retention laws. ExpressVPN uses DNS servers with DNS leak protection built-in. If your connection drops randomly, then an internet kill switch will temporarily halt all traffic until it’s restored. BEST VPN FOR WATCHING FOXTEL WHILE ABROAD:ExpressVPN is our #1 Choice. Blazing fast and reliable. Great at unblocking all major geo-restricted streaming services. Top privacy features and keeps no logs. Try it risk-free with the 30-day money back guarantee. NordVPN has been in the game for over a decade and ranks fairly high on our list of the best VPNs for privacy and anonymity. Servers are bifurcated by location or type – there’s the option of choosing one based on your explicit purpose, such as anti-DDoS, video streaming, double VPN, Tor over VPN, and dedicated IP. 191 standard VPN servers are located in Australia and a further 11 optimized for P2P filesharing. Globally NordVPN offers 5,201 servers in 60 countries. The company uses the OpenVPN protocol encrypted with 256-bit AES protection and 2,048 bit DH keys. DNS leak protection is included by default and users have the option of connecting to a DNS server. NordVPN is incorporated in Panama so, from a legal perspective, it’s out of the reach of Western authorities. It accepts Bitcoin as payment, thereby adding an additional layer of privacy if users want. Nord has a strict “no-logs” policy in any case, which means there’s zero possibility of any incriminating data being traced back. BEST BUDGET VPN:NordVPN offers great value. Top budget all-rounder that works well with Foxtel while abroad. Strong security features and allows up to 6 devices to be used simultaneously from one account. Includes a 30-day money back guarantee. You can read our full review of NordVPN here. CyberGhost combines a neat user interface with a fast connection and reliable service. It’s a recommended option for beginners who don’t want anything fancy and would rather have a plug-and-play system that works all the time. There are, however, some lingering concerns for privacy advocates. CyberGhost says it doesn’t store any user logs or data but it was recently acquired by an Israeli firm so the policy might be disrupted. We’ll keep you posted. There are over 3,787 servers spread across 60 countries including 76 in Australia so accessing Foxtel won’t be an issue. CyberGhost Pro uses 256-bit AES encryption on the OpenVPN protocol by default along with 2,048-bit RSA keys and MD5 HMAC authentication. These standards put it in the top-tier of VPN services. GREAT FOR STREAMING:CyberGhost provides access to lots of geo-restricted content including Foxtel. Its easy-to-use apps are ideal for beginners. Plans come with a 45-day money-back guarantee. IPVanish is considered to be a tier-1 VPN provider because it physically owns and operates all of its servers as opposed to other companies that either rent or use a combination of the two. This decision gives it full control over all the internet traffic tunneled through its servers and makes it much harder for nosy agencies like the NSA to detect user behavior. IPVanish has a stated policy of not keeping any traffic logs except for when an account is registered for the first time. Servers perform well when subjected to speed tests and there’s 59 of them based in Australia. Globally the company offers over 1,300 servers in over 75 countries, including 67 in Australia. They’re secured with 256-bit encryption on the OpenVPN protocol, SHA512 authentication, and a DHE-RSA 2,048 key exchange with perfect forward secrecy. Bitcoin is an acceptable form of payment. IPVanish is based in the US, but its no-logs policy should allay concerns. There are apps for both Android and iOS with desktop support for Windows and Mac OS also included. UP TO 10 DEVICES:IPVanish has a large network of servers and handles multiple connections well. Easy to use and preferred by users who need high standards of privacy. Good for Foxtel but can’t unblock as many other streaming services as some of its rivals. 7-day money-back guarantee. Here’s our in-depth review of IPVanish. VyprVPN is one of the few VPN services that’s able to skirt China’s Great Firewall with ease making it a popular option in the heavily censored country. It’s also considered to be a tier-1 provider as it physically owns and operates all of its servers across the globe. The company doesn’t give a number of how many servers it manages in Australia, but there’s a total of three locations – Sydney, Melbourne, and Perth – so connectivity shouldn’t be an issue. All connections use the OpenVPN protocol, 256-bit AES encryption, 2,048-bit RSA keys without perfect forward secrecy, and SHA256 authentication. DNS servers are included and DNS leak protection built-in. There’s also an internet kill switch which will freeze traffic if the connection drops. But VyprVPN is incorporated in Switzerland so it doesn’t fall under the purview of authorities in the US or UK. So far there haven’t been any noticeable complaints of the company handing over data as and when requested. There are apps for Windows Phone, Android, and iOS as well as desktop support for Windows and Mac OS. Read our user review of VyprVPN here. It’s possible to access VPNs for free – they’re floating around the web. These services will work but you won’t get the same speed and stability that a paid VPN service offers. A free VPN service still has to make money to pay for server space, engineers, and other maintenance costs so it’s not an internet charity by any means. It will monetize by intrusively tracking your browsing history, selling that data to third-party advertisers, as well as bombarding you with ads. That’s a terrible process and a stark reminder of the fact that typically when the product is free, you end up being the product. In the past, some VPN services, most notably Israel-based Hola, have also used their critical mass to attack other sites. By subscribing to a free VPN option, it’s possible that your machine could be used as a pawn in a larger game. It’s possible to stream Foxtel on your Android or iOS smartphone using the companion app. You’ll need to be an existing subscriber – either to the home set top box package or via Foxtel Play – in order to log in. Once you have the authentication details, it’s as simple as connecting to a server in Australia using your VPN provider app. It’s recommended that you first restart your phone and disable the GPS option so that the process is seamless. The official Foxtel Go app is also compatible with Apple TV, PlayStation 3 & 4, and Xbox One. These devices don’t support VPN apps by default, but it’s still possible to connect by leveraging the VPN on a physical or virtual router. Scroll down in this article to find a tutorial on how to set up a VPN on a virtual router for both Windows and Mac devices. The future of Australia’s largest media and home entertainment company has been brought into question by some analysts. They point to shifting consumer preferences for things like streaming video on demand, a concept popularized by Netflix. Such streaming services offer a vast library of content and are relatively inexpensive. There have also been rumors that Telstra – which owns a 50 percent stake in Foxtel – has been looking to offload its share. Such a move will probably force a devaluation of the company. But Foxtel is digging its heels in for a fight. In September it signed a deal with production behemoth HBO, giving it muscle in the fight against incumbents like Netflix and iFlix. The move also indicated a willingness on the part of senior execs at the firm to recognize that TV consumption patterns are changing and that Foxtel runs the serious risk of fading into obscurity if it doesn’t pivot. Why should I use a VPN in Australia? Australian telecommunication providers are required by law to track and store user data for up to two years. There are logs of everything, from your email and IP address, location, amount of data consumption, as well as who you’re speaking with via call, text message, and email. Read our explainer on Australia’s data retention laws. Using a VPN is also a recommended option for netizens in Australia. The country’s decision to block BitTorrent sites means there’s no other way to download torrents safely and securely other than to sign up for a VPN. We don’t condone downloading illegal content – so use torrent files only when you’re sure they’re not protected under copyright laws. Related: Here’s our list of the best VPNs for Australia. I tried Nord VPN last year in Thailand and couldn’t get Foxtel, anyone tried other VPNs that can DEFINITELY get Foxtel?